What is an essay as a literary genre? An essay is part of human communication, which is definitely worth mentioning for a number of reasons. First, it is a flexible small genre of literature that can serve lots of purposes like or introduction of a topic to wide audience, part of a future novel or application for college or university admission. Besides and no less important, in some modern countries, notably the USA and Canada, essays have been selected as a common element of the educational process. They serve as a convenient format for testing the students’ abilities and diligence. It is believed that such a relatively free and flexible task as writing an essay has many benefits over the commonplace tests and exams. 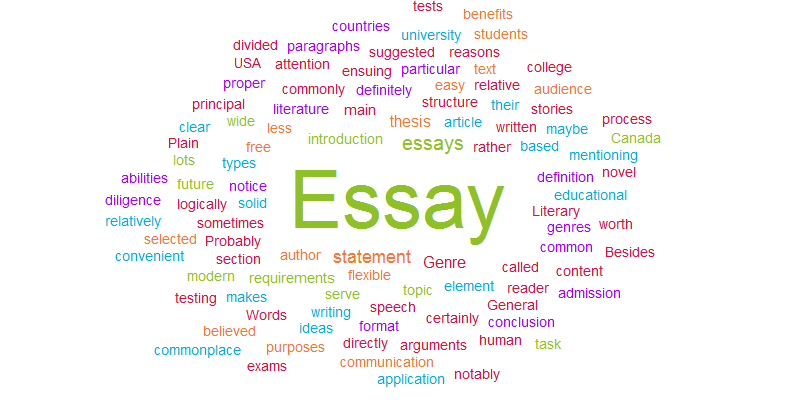 Essays as a format of written speech are usually divided into several types. The commonly recognized classifications may include expository, dialectic, descriptive, cause-and-effect, comparative and some other subdivisions. But, like the literary genres are often more or less closely intermingled between each other, so are the sub-divisions of the essay genre, or better to say the different essay types. Overall definition of essay describes this form of written speech as a comparatively short piece of writing that allows the author to express his own argument on the topic. Such a definition is certainly rather vague. It is easy to notice that, based on that formulation, essay overlaps with a number of other genres like article, paper and a short story. However, there are differences. Why is not an essay just an ordinary article? Because essays are not necessarily to be published in a medium. Hence, no requirements for a printed or electronic article are applied. Then maybe it is more like a paper? No, it is not. An essay needs not be a scientific speech, thus no requirements apply for sufficient proof of the hypothesis and all that stuff. Though, certainly, well based and solid argumentation is welcome, and even sometimes necessary (in particular in argumentative essays). And essays are not kind of stories. Certainly not. Stories belong to literature with all ensuing consequences. Even at that point, one can easily notice a common characteristic about the essays, which is their relative freedom from requirements. Indeed, lack of any severe requirements. The author does not owe anything to anybody. Probably that’s an important reason for the genre’s popularity, including as an educational tool. Though the essay structure may be rather flexible, still there are certain rules, in particular, as to the essay structure. First comes as usual, the introduction. It is commonly suggested to insert in it some phrases that should attract the reader’s attention, so called “attention grabbers”. It is like a hook that makes the reader move on through the text until the puzzle is resolved. The essay’s length may greatly vary from one to several paragraphs, but it is recommended, to place, in the end of the introductive section, a statement that eases the introduction to the main part. Such a statement is usually called a thesis statement. It represents a sentence that expresses the main idea of your whole work. However, it is even better if you manage to combine a few ideas in one or two sentences. A proper thesis statement is like an informative summary that makes the principal ideas clear to the reader and, in so doing, streamlines the whole story. In the essay’s main section, the author should represent a few solid paragraphs where you develop the main point of your paper. Your story will go smoothly if the beginning of your essay directly continues the thesis statement placed in the end of the introduction part. Then it is suggested to follow the thesis statement with one or more strong arguments, which definitely prove the content conveyed by the thesis statement. Despite the general relative flexibility of the essay as a verbal genre, these arguments should be rather clear and avoid ambiguous interpretation. And finally, in the conclusion, the author logically states the judgment or decision directly ensuing from the reasoning represented in the previous text. The conclusion of a proper essay virtually wraps up the whole work by reviewing its principal points. And, in the very end, it is correct to place a so called takeaway element, which the readers may take with them after reading the essay. A vivid image, unexpected idea or even call to action all may perfectly serve this purpose. Logically, if essays are sometimes important, somebody has to be engaged in assisting you in their fabrication. You can find quite a few businesses who will offer you competent essay writes to provide you with only plagiarism free content. To double your pleasure, they will ensure you an overwhelming customer support that will probably reduce your whole job to just a little more than submitting them the topic. However, maybe it would be wise of you to try to create essays by your own?